Pentasiete KIDS is an art studio specialized in the artistic and creative development of children through multidisciplinary art workshops for kids between 4 to 10 years old. We also offer the families artistic instruction, projects exhibitions, events and cultural trips. Art helps to stimulate the process and development of maturity in children. It is a way of communication and expression that helps them promote mental skills. Also, it promotes self-esteem, exploration, independence, critical thinking and helps them expand their emotional character. 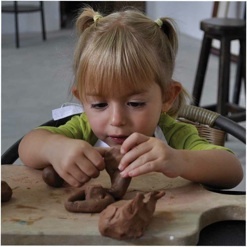 In Pentasiete KIDS we believe that children are the artists of the future which is why we consider developing their own artistic languages is very important. Creativity must surpass all possibilities and passion should be the motor of our actions. We encourage the practice and introspective thinking through experimentation, encounter with oneself, dialogue and exchange of knowledge and experiences. We believe in art sustainability and the importance of the independence of children and the inclusion of them in exhibitions and cultural events. Our purpose is to offer an education that integrates an entire artistic process, from the creation of an art work to its final public exhibition..
We focus on enhancing the creative virtues of children / as, taking into account the purity of his ideas and ease of creation they have. We contribute to the intellectual growth of the smallest through free exploration variety of materials and in a caring environment. The TAB Methodology is an art education methodology that considers the interests and abilities of every kid in order to build processes of thinking and artistic creation that are fun and meaningful. Discover the creative world of Pentasiete KIDS!